We describe a novel approach to inferring 3D curves from perspective drawings in an interactive design tool. Our methods are based on a traditional design drawing style known as Analytic drawing, which supports precise image-space construction of a linear 3D scaffold. This scaffold in turn acts as a set of visual constraints for sketching 3D curves. We implement analytic drawing techniques in a pure-inference sketching interface which supports both single and multi-view incremental construction of complex scaffolds and curve networks. A new representation of 3D drawings is proposed, and useful interactive drawing aids are described. 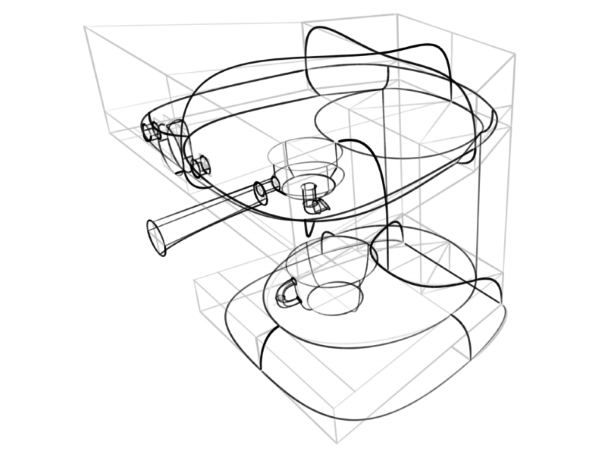 Novel techniques are presented for deriving constraints from single-view sketches drawn relative to the current 3D scaffold, and then inferring 3D line and curve geometry which satisfies these constraints. The resulting analytic drawing tool allows 3D drawings to be constructed using exactly the same strokes as one would make on paper.